New Town Macon commissioned Nimrod Long and Associates to design the master plan for this 8-mile trail riverfront system connecting downtown Macon and surrounding neighborhoods with the Ocmulgee River. Our commission includes design documents and construction administration for the multi-phased construction, and design development of new parks and recreation areas that expand the original trail master plan. Phase One of construction began in late 2001 and includes trail, riverfront overlooks, boat access and visitor parking. 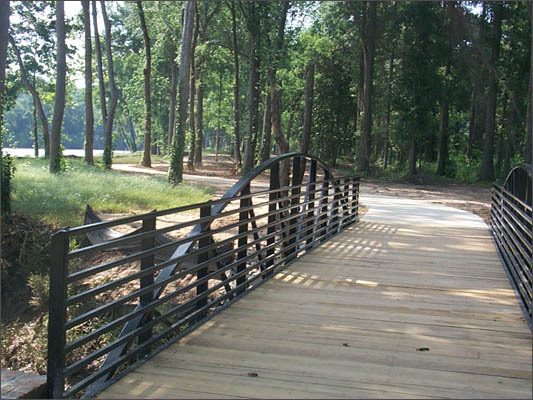 Future phases will expand the trail system to adjacent city parks and neighborhoods and connect the River walk to the nearby Ocmulgee Mounds National Monument. To the north, the trail will connect to Water Works Park, a 250-acre passive park in an ox-bow of the river. The park will feature picnic areas, canoe boat launch, large open space and nature trails.